A fun game for children to play is repeating what someone says, usually to annoy them. Here is a list of apps that will give your child a taste of their own medicine, keep them entertained, and more importantly, keep them from mimicking you. 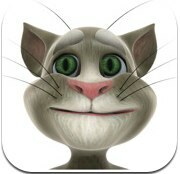 Talking Tom is back. And he now has a friend. 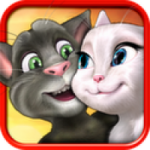 Everyone’s favorite talking cat has a new and improved version of his app. New features include the ability to customize his appearance by buying him clothes and accessories – which can be bought with coins that you either buy or you get by opening the app daily or allowing push notifications. Tom has also moved out of the alley and has a neighbor, Ben, who likes to fart, scare Tom, and hit him with a pillow. And now you can poke Tom, slap him, pull his tail. 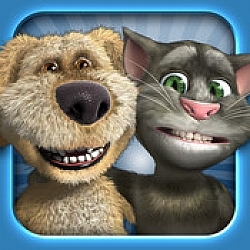 Tom will also play with the original Talking Tom app and will repeat himself. Free, with in-app purchases. 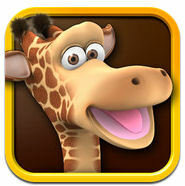 Gina is an adorable giraffe and she will repeat anything you say, but she also has lots of other features. Gina loses and gains energy, so you need to feed her, give her drinks and play patty cake with her so she can gain energy. If you poke her, she loses her energy. There are 48 levels and 3 speeds of fun when you play patty cake. Once Gina gets to 70% energy, she will juggle 3 apples for you. At 90% she’ll give you some kisses and 100% you get a new baby giraffe. There are in-app purchases so you can buy more food and drink to make her happy. Free, with in-app purchases. Tom and Ben are talking newscasters who like to bother and tease each other. They also take turns repeating everything you say. And you can be apart of the news, take video of yourself and it will playback. You can also poke Tom and Bed to make them fall off their chairs, or swipe them and they will swivel around. The dog paw button will make Bed hit Tom with a boxing glove or toy dart gun. Tom can retaliate, but you have to pay for that feature ($2.99). Press the sword button to see them wrestle. Free, with in-app purchases. Poke or tickle Ginger, the cat, and he will purr and laugh. He will also repeat all of your words. Press the toilet paper button and it will start a little game, which will help you gain more pieces to the puzzle to solve Ginger’s mysterious dreams. You can also give Ginger a shower, dry him with the hair dryer, and brush his teeth; all which will get you puzzle pieces. Every 24 hours you can play a wheel game, which will earn you more toothpaste to brush Ginger’s teeth. Free, with in-app purchases. Tom is in love with Angela and he’s outside her balcony to show her. He will repeat things that you say, but he will also give Angela gifts – a ring, flowers, and a watermelon. Press the music note and Tom and Angela will sing a duet, “You Get Me”, which you can also purchase for $0.99. Angela can start a chat with Tom where she asks questions and you can type the answers Tom will give. Shake your device and it will create an earthquake. Press the flower pot and Ginger appears, breaking the pot over Tom’s head. $0.99. 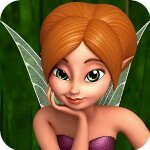 Lila is a pretty, singing fairy who will repeat what you say. Change the background to the daytime or nighttime and use Lila’s wand to do a variety of magic spells. During the day, a bee appears, and flowers grow. One flower comes with a cute ladybug and the others play sounds when you tap on them. At night, create bubbles that you can pop, make a heart or Lila will light up. You can also poke, tickle and swipe her for different reactions. Free, for a limited time. All of these apps allow you to record video of you playing, which you can share on Facebook, You Tube, or via email. You can also view videos that others made through each app.